I first met Athena Calderone of Eye Swoon through my husband at The Heyward, a local Brooklyn restaurant where he was executive chef. Athena's passion for food and all things beautiful was clear from our first conversation, and I quickly became an avid fan and follower. Both Derek and I got the opportunity to be featured on her site- Derek as part of "The Chefs" series, and me as one of "The Tastemakers". Athena came over and we baked a chocolate and toasted coconut cake with salted caramel (that I highly recommend you try! ), and it soon became clear that we had a lot in common, from food to fashion! Athena and I have gotten close over the last couple of years, and often see each other out & about at various fun events! I was so excited, and not all that surprised, when I heard that Athena was writing a cookbook. Her background in design gives her an eye to be able to create beautiful, artistic dishes, so I just knew the book would be absolutely swoon-worthy. Cook Beautiful is just that- Athena's offering of 100 seasonal recipes that are both gorgeous and delicious! After browsing through the entire book and drooling over practically every photo, I decided the first recipe I wanted to try would be a dessert (duh!). The butterscotch pots de crème with salted caramel tahini sauce & toasted kasha really spoke to me, as I've been having a love affair with tahini for as long as I can remember. Seriously though, whether it's sweet or savory- it can be stuffed into Medjool dates with dark chocolate, or mixed with lemon juice and herbs for a dressing, I'm obsessed. Naturally then, I had high hopes for these babies, and they did not disappoint. 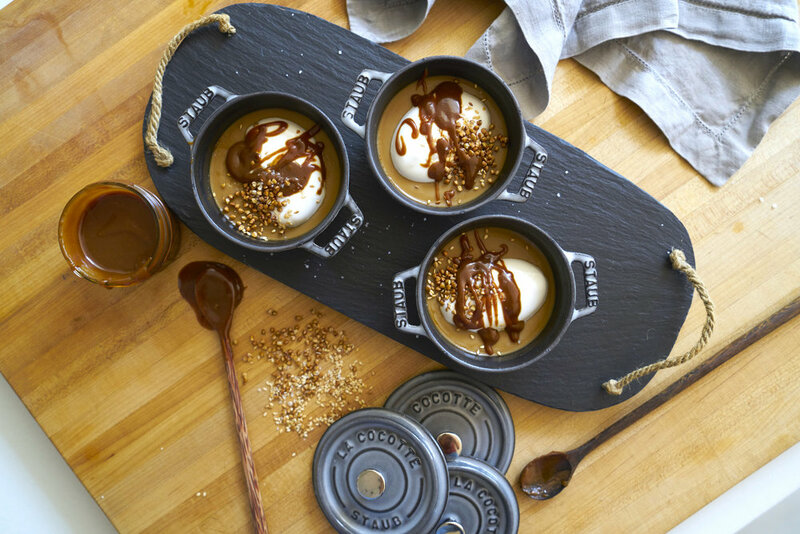 The rich and smooth butterscotch crèmes were complemented perfectly by the slightly savory tahini caramel, as well as the crunchy toasted kasha & sesame seeds. Bonus points that they look super fancy, but are actually quite easy to make- these would be a great dessert to impress guests at your next dinner party. Get your copy of Cook Beautiful today, and start creating beautiful, swoon-worthy food pronto!